If you regularly suffer from chronic vertigo or dizziness, then you will know that treating this condition is far from easy. vertigo and dizziness come about as a result of a complex inner-ear issue where a build-up of particles start shifting upon movement, which makes the person feel an intense spinning sensation. Here is a natural remedy to vertigo that you can practice at your home. Dr. Carol Foster’s special method to stop vertigo as soon as the patient starts experiencing its first signs. 1. Get down on your knees so that you’re sitting on the backs of your heels. 2. Tilt your head back with your eyes looking skyward – don’t worry if your dizziness increases momentarily. 3. While staying on your knees, put your hands on the floor in front of you and let your head hang loose, with your chin slightly tucked in. 4. Turn your head to your left or right elbow (depending on what ear you wish to treat). Palm oil is everywhere, It is an edible vegetable oil derived from the fruit of palm oil trees, that are grown in the tropics. As the World Wildlife Federation notes, 85 per cent of the global supply of palm oil comes from Indonesia and Malaysia. Being cheap, palm oil is a very popular cooking oil, particularly in Asian and African countries. Additionally, in the west, Palm oil is found in Instant noodles, Pizza dough, Bread, Margarine, Cookies, Chocolate, Ice cream, Shampoo and Lipstick. Additionally it is also sold under a variety of other names: Elaeis guineensis, Etyl palmitate, Glyceryl, Hydrogenated palm glycerides, Octyl palmitate, Palm fruit oil, Palm kernel, Palm kernel oil, Palm stearine, Palmate, Palmitate, Palmitic acid, Palmitoyl oxostearamide, Palmitoyl tetrapeptide-3, Palmityl alcohol, Palmolein, Sodium kernelate, Sodium laureth sulfate, Sodium lauryl lactylate/sulphate, Sodium lauryl sulfate, Sodium palm kernelate, Stearate, Stearic acid, Vegetable fat, Vegetable oil. Palm oil is cheap. It gives products a longer shelf-life, can also sustain high temperatures, and is both odorless and colorless, so it won’t change the product it’s incorporated into. And it is efficient to produce. Palm oil is partially responsible for the rapid deforestation in areas in Indonesia and Malaysia. Palm oil is often cited as the primary cause of the mass die-off of orangutans, who’ve shrunk from a population of 350,000 in 1990 to an estimated 50,000 (and with little chance of survival). Recently, issues of child labor have also arisen with a number of palm oil producers relying on children as young as eight as part of their workforce. Look for a product with a green “RSPO” sticker or a “Green Palm” label (this shows that a producer is making the transition to a more sustainable production process). 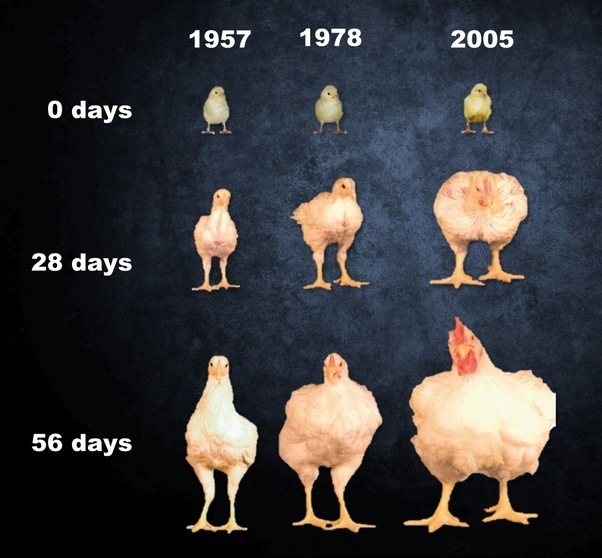 Your chicken is unnatural – Perhaps GMO. This is how they are bred – inhumane. There’s almost no such thing as a farm. Farms are replaced by factories, in which animals are jammed in spaces as big as themselves and abused.